In response to heated community pressure, approximately one third of the western, coast of the Big Island of Hawaii has been set aside as FRA’s closed specifically to aquarium collection. Department of Land and Natural Resources, State of Hawai’i. I added that I had quoted Brian Tissot, a Washington State University marine ecologist, who reported more than three years ago (“Something’s Fishy,” The Smithsonian, December 2001) that in Hawaiian waters targeted by aquarium collectors, populations of eight of the most popular species had fallen by 38 to 57 percent. (Advanced Aquarist Online Magazine, March 2002). The most recent data from Dr. William Walsh, marine biologist of the state’s Division of Aquatic Resources (DAR), indicates that for the fiscal year 2004, more than 300,000 reef fish were collected from Hawaii’s reefs for the aquarium trade – 84% of which are yellow tangs, yielding a figure of well over 250,000 yellow tangs taken for the year. Other species are taken in smaller numbers. Virtually all of these fishes are taken from the West, or Kona, Coast of Hawaii, where I live. Take totals started rising significantly in the late 1980’s and early 90’s, both for fish taken and fishing permits requested and issued. The depletion of reef fishes, especially yellow tangs, brought strong negative reactions from other reef users, especially snorkelers and scuba divers, leading to community pressure to close the entire coast to all aquarium collecting. A petition recommending this action collected more than 4,000 signatures. In April, 1999, DAR held what turned out to be its largest-ever local hearing, drawing almost 900 testimonies. Of these more than 90% were in support of Fish Replenishment Areas (FRA’s), closed to aquarium collecting, and covering a minimum of 30% of West Hawai’i’s coastline. This strategy is close to one Scott recommends, stating as one of his “Seven Steps” that marine aquarist should “Encourage and support the development of reserve areas where no fishing of any sort occurs. These types of locations are known as Fish Replenishment Areas (FRAs) where adult fish can populate vast tracks of coastline with their young. This fisheries management technique has been put into practice here. In response to heated community pressure, approximately one third of the western, coast of the Big Island of Hawaii has been set aside as FRA’s closed specifically to aquarium collection. These FRA’s are in addition to other partially or fully closed marine management areas. 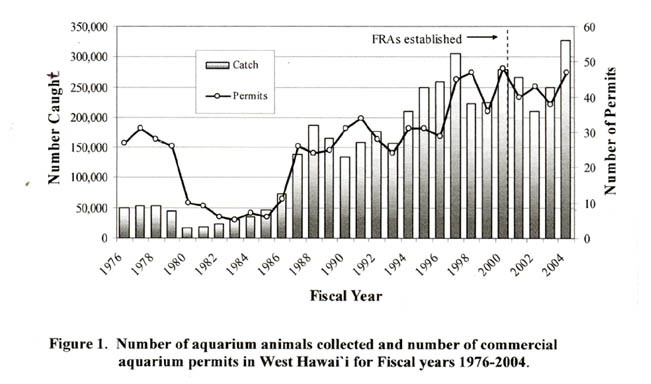 The location of the FRAs were established after consultation with all concerned user groups, including aquarium fish collectors, by a community-based Fisheries Management body, the West Hawai’i Fisheries Council (WHFC) which was convened in 1998 and continues to function and on which I serve. The areas were set aside in 1999, with a mandate that the University of Hawaii conduct annual surveys of aquarium fish populations and that a major evaluation of the effectiveness of the program was to be done in 5 years. This major evaluation has just become available to the public and is the basis for the information reported in this month’s column. Dr. William Walsh and Hawai’i’s Division of Aquatic Resources are to be congratulated for producing a document rich in detail and analysis on this important fisheries management technique. It contains important specific direction and advice for those, both fisheries management scientists and concerned citizens of coastal communities who wish to participate in the further utilization of the successful FRA strategy.